Sun Pacific is vertically integrated, ensuring the highest quality produce throughout the supply chain, from careful planting and harvesting, to meticulous packing and shipping, and exceptional selling and marketing. 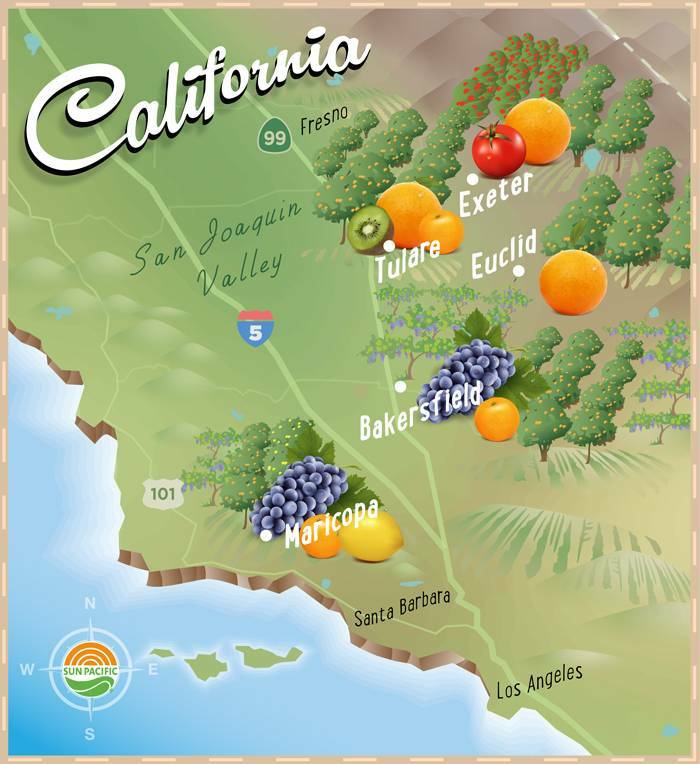 Our competitive advantage is built on the innovative and entrepreneurial spirit that began with our founder’s vision – to cultivate the fertile California land and create specialty produce that delights customers and consumers across the country and beyond. Sun Pacific owns and operates land that expands from Bakersfield to the Sequoias in the San Joaquin Valley of California. We use the most sophisticated methods available to deliver the highest quality and safety of our products. The California environment provides perfect weather conditions for growing healthy and delicious produce, with mild temperatures and naturally rich soil. We carefully select the proper rootstock to grow the healthiest and best tasting fruit. Our comprehensive selection process for all of our produce combines sensory aspects with scientific methods of testing to ensure just the right mix of characteristics for each piece of fruit. Sun Pacific experts in the field are equipped with the latest handheld technology to measure key traits like size, color, sugar-to-acid ratios, among others. This selective approach allows us to pick only the fruit that’s at the peak of its flavor, which sets us apart and translates into customer and consumer satisfaction. We pack and ship more than 75 million boxes of produce around the globe. Our footprint of 1,200,000 square feet of state-of-the-art packing facilities allows us to pick, pack and ship our fruit and deliver it to consumers in less than seven days. We invest heavily in leading technologies to custom pack produce for a range of specifications required by our partners across North America and around the world. This customized approach, coupled with our logistic and distribution capabilities, allows us to maintain superior quality beyond the farm gates, throughout the supply chain and into our customers’ hands. Our commitment to growing, harvesting and delivering the highest level of quality fruit in the market today is firmly grounded in an unshakable spirit of innovation that launched our company in the late ‘60s and continues to drive each facet of our operation every day. This is the reason demand remains high for Sun Pacific’s lineup of consumer preferred produce brands.